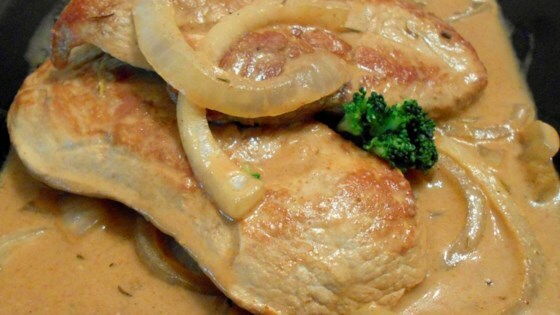 "Pork chops with beef broth, onions, and sour cream served with white rice. I tend to make 1 1/2 cups dry rice with 3 cups water in a rice cooker while the pork chops are simmering. Beef broth is good in this, but if you have any leftover French onion soup, try that instead." Heat a skillet over medium heat. Cook pork chops in hot skillet until browned, 2 to 3 minutes per side; add onions. Stir broth, Cajun seasoning, mustard, paprika, and savory together in a bowl; pour over the pork chops and onions. Place a cover on the skillet, bring the liquid to a boil, reduce heat to medium-low, and simmer until the pork is slightly pink in the center, 30 to 60 minutes. An instant-read thermometer inserted into the center should read at least 145 degrees F (63 degrees C). Stir sour cream into the liquid in the pan; continue cooking until warmed, 2 to 3 minutes. See how to make this sophisticated but surprisingly simple dinner. Followed recipe exactly but it wasn't all that the reviews would lead you to believe. Pork chops were virtually tasteless and tough. Won't be repeating this. Pork chops were tender and the "gravy" added a nice sauce to the chops and the rice that I served with it. Wow! This came out awesome! I added some green beans to make it a one dish meal. The family loved it! !